Students need to interact with current technologies and educational resources that will prepare them for a highly technological future. Providing these resources for our students is costly, and often beyond the means of the general school budgets. Contributions to this fund will support innovative science curriculum development and cutting edge technology focusing on investigative and hands-on learning. When Rob Gouvin and his Granite Team colleagues, Chris Ritacco, Darren Mansfield, and Mike Reyes, were awarded the first-ever WEEF focus grant for the program proposal, “iPads in the Classroom,” there were several types of learners they thought could benefit from the technology and applications they planned to use. Among those learners, there were students who needed more support to understand key concepts. And there were students who needed enrichment because they grasped the concepts quickly. And then there were students like Julie. Julie was a quiet and reserved girl who didn’t like to respond out loud to questions in class for fear of being wrong. However, the “iPads in the Classroom” grant opened up her world. Through these devices, students answered many questions electronically. Julie was able to submit answers which were displayed to the class while still being anonymous. She began to feel more and more comfortable with her peers once she saw that she was doing well and she slowly began to come out of her shell. Julie used the iPads to create video projects. These projects were designed to let her give the answer key both through video and audio form. She was not only able to write her answers to the performance tasks, but also share her ideas and thought process by doing voice-overs on the video she produced. It gave her teachers the ability to see into her mind and listen to her methods and thought process. It was a win-win for both parties. 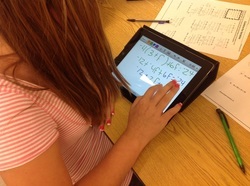 The iPads, partially funded by WEEF, broadened her class experience. Since she was able to gain confidence in her classroom tasks, she became a leader and example for her peers. They saw a quiet student who was able to conquer her fears turn into a student who, through self-confidence, was able contribute and participate. Programs like “iPads in the Classroom” can change the landscape of schools. Julie’s ability to use technology empowered her as a learner. It illuminated her strengths and her contributions for her peers, who may not have realized that their quiet classmates have much to offer the world. And, by providing a working example of technology in best practice, it provided professional development opportunities and opened up great dialogue among staff members who want the same kinds of opportunities for their own students. Please consider making a contribution to WEEF to support these types of enhanced learning opportunities for our students, and to support the growth of innovation in our schools.